The move to get hockey back into Thompson Rivers University in Kamloops is staring a hard deadline squarely in the face. The B.C. Intercollegiate Hockey League has given those working to save the program a deadline of May 3 to gain re-entry. All along, Bast has planned on raising money through sponsorships and fundraising. Now, though, things have changed. Bast has done a lot of work and research on this project; in fact, he has been working at it since the university pulled the plug on the WolfPack prior to the start of the 2014-15 season. He has calculated that the “minimum survival budget” is $70,000 per season. Each player will be on the hook for $1,800 per season to play and won’t receive help towards books, tuition or housing. Thus, Bast said, the players shouldn’t “be under any pressure to provide that next $25,000 to survive. As a team they will be responsible to fund raise, acquire sponsorships and be great ambassadors of TRU. But the year-to-year stress to survive as a team should not be on them. It is that $25,000 that will allow the project to move ahead . . . or, on the other hand, to wither on the vine. “That next $25,000 is critical to proving to the powers that be that we have a long term sustainable model,” Bast said. “It doesn’t matter to us if one person offers that money or a combination of 10 people make up that amount. What is important is that we find that sort of support lasting over a three-to-five-year period to help this program get back on its feet and be around for many years to come. This is Bast’s last-ditch effort. He knows that the door closes on May 3. If you are able to help, would like to get involved, or have any questions, email him at trevorbast@gmail.com. In Cranbrook, the Kootenay Ice forced a seventh game with a 4-2 victory over the Calgary Hitmen. . . . They’ll decide it Monday night in Calgary. The game will be televised by Shaw. . . . The Hitmen had won 7-2 in Cranbrook on Wednesday to take a 3-1 lead in the series. The Ice then won 5-4 in to in Calgary on Friday. . . . Last night, Ice F Jaedon Descheneau broke a 1-1 tie with his fourth goal at 14:55 of the second period. . . . That goal came after F Adam Tambellini pulled Calgary into a 1-1 tie with his sixth goal at 11:19. . . . F Tim Bozon had given the home side a 1-0 lead with a PP goal at 13:40 of the first. . . . Ice F Luke Philp added insurance with his fifth goal at 17:45 of the third. . . . That goal was needed, too, because Tambellini got his seventh goal at 18:35 to make it a one-goal game. . . . Kootenay’s Sam Reinhart added an empty-netter at 19:59. . . . Ice G Wyatt Hoflin stopped 25 shots. . . . Calgary starter Brendan Burke gave up one goal on 14 shots before leaving at 12:31 of the second with an apparent injury. He departed after stopping a shot by Ice F Ryan Chynoweth. . . . G Mack Shields came on to stop 11 of 13. . . . Burke is to be re-evaluated today before the Hitmen will be able to decide on their goaltending for Game 7. . . . The Ice was 2-for-3 on the PP; the Hitmen were 0-for-3. . . . Attendance was 2,645. . . . BTW, the game-winning OT goal in the Ice’s 5-4 victory in Calgary on Friday has been changed to F Luke Philp, his fourth goal of the series. It had been credited to F Levi Cable. Philp finished the game with two goals and three assists. . . . Trevor Crawley of the Cranbrook Daily Townsman has a game story from Saturday right here. In Medicine Hat, F Trevor Cox broke a 3-3 tie at 18:14 of the third period as the Tigers beat the Red Deer Rebels, 4-3. . . . The Tigers won the series, 4-1, and now await a winner between Calgary and Kootenay. . . . Medicine Hat has reached at least the second round in seven straight springs and 12 of the past 13. Yes, think about that for a moment or two. . . . Red Deer will be the host team for the 2016 Memorial Cup tournament. . . . The Rebels didn’t have an answer for the Tigers’ top line in this one as it accounted for all four goals. . . . F Steve Owre had two goals and an assist, while F Cole Sanford had his fourth goal and two helpers, and Cox had one of each. . . . Red Deer F Evan Polei gave the Rebels a 3-2 lead at 3:29 of the second period, on the PP. . . . Owre tied it with his second goal of the game, and third of the series, at 18:03 of the second. . . . Cox had three goals in the series. . . . F Riley Sheen had a goal and an assist for the Rebels, with D Brett Cote adding two assists. . . . Tigers G Marek Langhamer turned aside 28 shots, while Red Deer’s Rylan Toth stopped 32. . . . Red Deer was 2-for-7 on the PP; Medicine Hat was 1-for-5. . . . Attendance was 4,006. In Victoria, F Brandon Magee scored at 1:42 of OT to give the Royals a 5-4 victory over the Prince George Cougars. . . . The Royals won the series, 4-2, and will meet the Kelowna Rockets in the second round. That series will open with games Friday and Saturday nights in Kelowna. . . . Magee finished the series with six goals. . . . F Alex Forsberg, who was selected first overall by Prince George in the 2010 bantam draft, had the primary assist on Magee’s goal. . . . Prince George F Brad Morrison forced OT when he scored a PP goal with 1:14 left in the third period. . . . The Royals led 3-1 after one period and 4-3 late in the third period. . . . Victoria G Greg Chase scored three times, his third goal providing a 4-3 lead at 15:16 of the third. He’s got five goals in the series. . . . F Zach Pochiro scored the Cougars’ first three goals, giving him four. He cut Victoria’s lead to 3-2 at 15:14 of the second on a PP and then tied the game at 14:00 of the third. . . . F Jack Walker and F Tyler Soy each had two assists for Victoria. . . . F Jansen Harkins drew two assists for the Cougars. . . . Victoria G Coleman Collrath turned aside 34 shots, 12 more than Prince George’s Ty Edmonds. . . . The Royals were 1-for-3 on the pp; the Cougars were 2-for-5. . . . Attendance was 5,839. In Everett, F Riley Whittingham scored at 15:25 of OT to give the Spokane Chiefs a 4-3 victory over the Silvertips. . . . The Silvertips still lead the series, 3-2, with Game 6 set for Spokane on Tuesday night. . . . The goal was Whittingham’s first of these playoffs. . . . Spokane D Nick Charif’s first goal, at 17:42 of the third period, forced extra time. . . . Everett F Kohl Bauml had broken a 2-2 tie at 12:44 of the second period. . . . F Markson Bechtold got the Chiefs on the board at 12:19 of the first period. . . . Everett took the lead on second-period goals by F Carson Stadnyk, at 2:59, on the PP, and F Brayden Low, his third, at 10:17. . . . Spokane F Liam Stewart pulled his guys even at 11:14. . . . Chiefs F Garret Hughson turned aside 36 shots, three fewer than Carter Hart of the Silvertips. . . . Spokane D Evan Fiala was tossed at 2:28 of the second period with a kneeing major and game misconduct for a hit on Everett F Patrick Bajkov. . . . The Silvertips scored one goal on the five-minute PP. . . . Everett was 1-for-4 on the PP; Spokane was 0-for-1. . . . D Ben Betker was back in the Everett lineup after sitting out two games with an undisclosed injury. . . . Everett F Dawson Leedahl sat out his second straight game with an undisclosed ailment. . . . Attendance was 4,249. . . . Nick Patterson of the Everett Herald has a game story right here. In Portland, F Paul Bittner scored twice to help the Winterhawks to a 5-3 victory over the Seattle Thunderbirds. . . . The Winterhawks hold a 3-2 lead in the series as the teams return to Kent, Wash., for Game 6 on Tuesday night. . . . Portland scored the game’s first two goals and Seattle never was able to equalize. . . . F Oliver Bjorkstrand, who had a goal and two assists, was in on both goals, from F Keegan Iverson and Bittner. . . . Seattle F Scott Eansor got his third goal, shorthanded, at 19:49. . . . 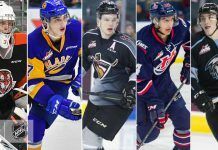 The teams alternated goals from that point on. . . . Bittner’s goals were his first of the series. . . . Bjorkstrand, who led the WHL in goals and points in the regular season, has eight points in his last two games. . . . Portland F Chase De Leo had two assists. . . . Seattle got two assists from F Cory Millette. . . . Seattle F Matt Barzal scored his fourth goal of the series. . . . Portland G Adin Hill stopped 27 shots, three fewer than Seattle’s Taran Kozun. . . . Portland was 1-for-3 on the PP; Seattle was 1-for-1. . . . Attendance was 7,119. . . . The game story Scott Sepich wrote for The Oregonian is right here. F Carter Rigby, who completed his junior eligibility with the Swift Current Broncos earlier this week, has signed on with the ECHL’s Stockton Thunder. Rigby, from Penticton, B.C., started the WHL season with the Kelowna Rockets and finished in Swift Current, totalling 46 points, including 18 goals, in 62 games. . . . The Thunder is affiliated with the NHL’s Calgary Flames and New York Islanders and the AHL’s Bridgeport Sound Tigers. . . . Rigby made his professional debut last night against the Ontario Reign. He had two shots in a 7-4 loss to the host Ontario Reign. D David Musil, 21, made his NHL debut with the Edmonton Oilers last night. Musil, whose father, Frank, also played for the Oilers, was a second-round selection in the 2011 NHL draft while he was playing for the Vancouver Giants. After playing three seasons with the Giants, he was traded to the Edmonton Oil Kings 14 games into 2012-13. Musil, who has been with the AHL’s Oklahoma City Barons, is the first ex-Oil Kings player in modern franchise history to play in a game with the Oilers. . . . The Oilers, of course, own the Oil Kings. D Justin Hamonic, who played out his eligibility with the Tri-City Americans, made his pro debut last night with the ECHL’s Anchorage Aces. He had one shot on goal in a 3-0 loss to the host Utah Grizzlies. . . .
F Colby Cave, who captained the Swift Current Broncos, is likely to join the AHL’s Providence Bruins after signing a three-year contract with the NHL’s Boston Bruins. Cave, 20, was an undrafted unrestricted free agent. . . . He previously had attended camps with the Arizona Coyotes and San Jose Sharks.